You woke up one day and decided to sell used cars for a living. 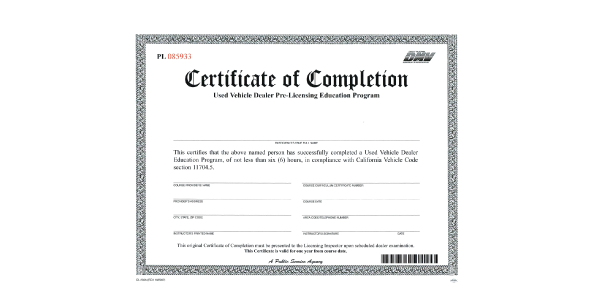 After some research you learned California requires you to obtain a used vehicle dealer license. Ok, what does that actually entail? Can I go to my local DMV branch, pay a fee, and get a dealer license? Not quite! Unfortunately there is a lot more to it than that. DMV’s website provides prospective dealer applicants with preliminary information on how to obtain a dealer license. However, the Pre-Licensing Course explains things in more detail. At first glance the Pre-Licensing Course may seem unnecessary. In fact, the predominant attitude among applicants is to find the cheapest education provider. The reality is it’s the most important part of the licensing process. Selling cars as a dealer is unlike that of a private party. There are several state and federal laws which apply to vehicle dealers. If they are violated, dealers will face administrative, civil, and criminal sanctions. By now you’re probably familiar with the famous DMV Dealer Education Provider List. But you’re probably asking yourself who are these people? Education providers are private companies, not DMV employees. The standard for becoming a provider is very low! Anyone can submit a “state compliant curriculum” to DMV to become an approved provider. If DMV is satisfied the curriculum meets their minimum requirements the provider is approved to teach the course. There is a huge misconception that DMV provides education providers with all course materials to be used in class. Not true! Every provider writes their own curriculum and submits it to DMV for approval. That means there are 40+ distinct dealer pre-licensing handbooks out there. Just because a provider met DMV’s minimum requirements does not mean you’re going to get a quality education. Before you choose a provider from the DMV list you should ascertain how long the company has been in business and who will teach the course. Though price is an important factor you get what you pay for! Dealer Intel was approved as a dealer education provider in 2007. Since then the company has evolved into a one stop shop for California Dealers. In addition to providing education we also offer consultation services to new vehicle dealers, used vehicle dealers, wholesale-only dealers, and auto brokers. The founder of the company has over 20 years of experience in the Auto Industry and is the sole course instructor. He obtained his California dealer license at the tender age of 18. Shortly thereafter, he became a DMV approved dealer education provider to get a better grasp of the legal framework surrounding the dealer industry. He quickly realized dealers were ill informed of the laws governing their own trade. He eventually enrolled in law school and currently runs a legal practice primarily focused on Auto Dealer Law. The Pre-Licensing Course is intended to apprise dealers of the laws relating to the dealer trade. DMV does not want you to get in trouble. But the reality is we only have 6 hours to cover the material. Do you want an amateur or veteran instructor in those 6 hours? The background knowledge and information we provide in 6 hours is equivalent to 20 years of experience in the dealer industry. There aren’t many providers that can make that claim. As the instructor in the above image indicated, “This is not like $5 online traffic school people!” Most dealer applicants tend to equate this class with something like traffic school. Most people know how to drive so they don’t put much value in a traffic school course. They either got caught speeding or ran a red light and have to take a “dumb class” because the court said so. Why would you pay $25 for traffic school when someone is offering it for $5. It is not advisable to think of a Dealer Pre-Licensing Course in those terms. This is a completely different world. If you don’t understand how all the rules work you’re eventually going to have a very bad day in terms of a civil lawsuit, DMV administrative action, or criminal liability. This is not the time to be a penny-pincher. Dealer Intel teaches the Pre-Licensing Course at the local Starbucks coffee shop in Marin City, California or the local library in San Rafael, California on occasion based on availability. We can also come to your location if its within 30 miles of San Francisco. An additional traveling fee will apply if you are farther away. How come you don’t have an office? The demand for this course is extremely low! There aren’t enough students signing up to justify the cost of renting an office. Why not? Because most prospective dealer applicants simply cannot afford the costs of running a dealership. It’s simple economics folks! Consequently, most education providers are forced to operate with low overhead costs. The Standard Pre-Licensing Course fee is $225. If you wish to bring additional participants they must register and pay separately. Unfortunately we don’t provide discounts for multiple participants. It is available on the first Friday of each month. The 1-on-1 Pre-Licensing Course fee is $395. If you wish to bring additional participants they must register and pay separately. Unfortunately we don’t provide discounts for multiple participants. The student and instructor will engage in a dialogue rather than a traditional lecture. Moreover, you can ask questions relating to your specific business model at anytime during class. It is available every Saturday and Sunday. Dealers are not all created equal. California offers 3 types of dealer licenses. A prospective applicant can apply for a New Vehicle Dealer License, a Used Vehicle Dealer License, or a Wholesale-Only Dealer License. Moreover, some dealers possess an Auto Broker endorsement. Dealer Intel offers every dealer the opportunity to consult with us on virtually any issue facing their dealership. The cost of the service is based on an hourly rate. If you are interested in this service please contact us. Most dealer applicants are directed to contact a DMV Education Provider from a list to get started on applying for a dealer license. There are approximately 40 private companies to choose from and naturally folks are looking for the cheapest course. What they don’t realize is the course price is the least of their concerns. Below is a list of what you can expect to pay if you want to open a retail dealership in California. The Standard Pre-Licensing Course is offered on the first Friday of each month. Classes start at 9:30 a.m. and are held in San Rafael, California. Please give us a call before registering to ensure a space is available. The 1-on-1 Pre-Licensing Course is offered every Saturday & Sunday. Classes start at 9:30 a.m. and are held in San Rafael, California. Please give us a call before registering to ensure a space is available. The course lasts 6 hours and is completed in 1 day. You will receive a notebook containing the course materials and exhibits. We will discuss each topic in detail so you understand your legal obligations when selling cars. You will take a final practice exam at the end of the course. You must make an appointment with your DMV Inspector to take the official Dealer Exam. We cannot reserve a course date if the student does not prepay. Due to past cancellations we no longer collect payment at the beginning of class. Refunds will not be given under any circumstance though you are welcome to reschedule a class. You will receive a DMV Completion Certificate at the end of class. You must provide it to a DMV Inspector before you are eligible to take the official Dealer Exam. California DL Or ID Is Required For The Dealer Exam? All dealer applicants must present a current California Driver License or Identification Card to DMV before they can sit for the dealer examination.